The Best Chili Recipe is one that is loaded with beef and beans and absolutely full of flavor… just like this one! 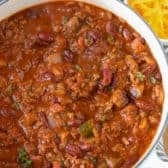 Chili is hands down one of my husband’s favorite meals (and I love it because it’s easy to make)! 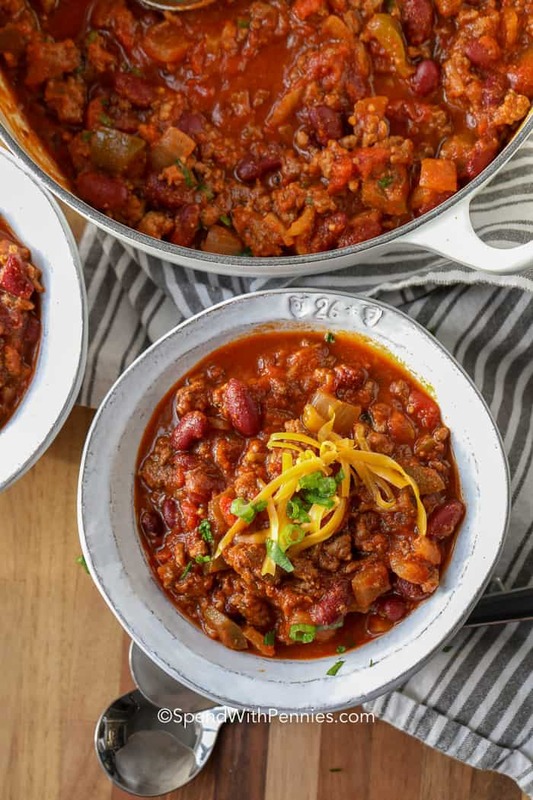 This easy chili recipe cooks on the stovetop and is perfect served alongside Homemade Cornbread, buttered toast or Buttermilk Biscuits. Add in your favorite toppings like cheese and onions for the perfect meal. 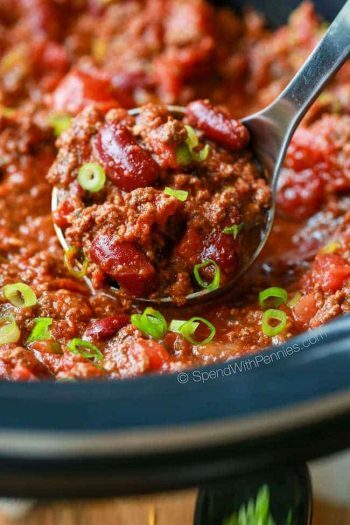 While I sometimes make crockpot chili, this easy version is great for a weeknight meal! Making chili is really easy! 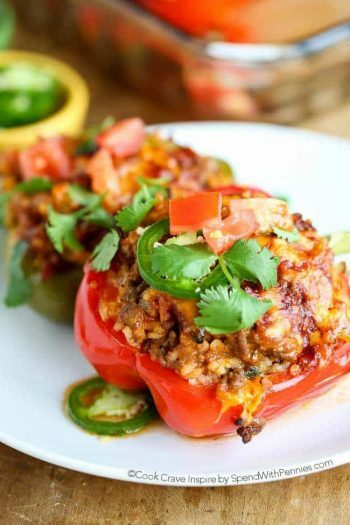 In this recipe I add bell pepper but you can skip it or add your own favorite veggies (peppers, mushrooms, zucchini are all great choices). The seasonings in this recipe are chili powder and cumin. I always make my own homemade chili powder but of course store bought works great too. What is in Chili Powder? Sweet paprika, garlic powder, cayenne pepper, onion powder, oregano and cumin. This is the perfect blend of spices (find my favorite chili powder recipe here). 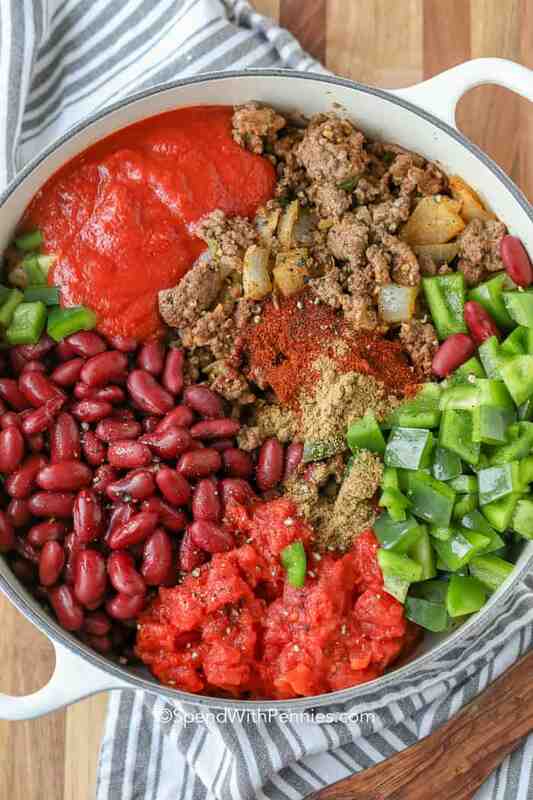 Mix Chili Powder into the raw ground beef before cooking to ensure every morsel is seasoned to perfection. I use canned red kidney beans but pinto beans or black beans work as well. Rinse beans (unless using chili beans) before adding to remove excess salt and starches. 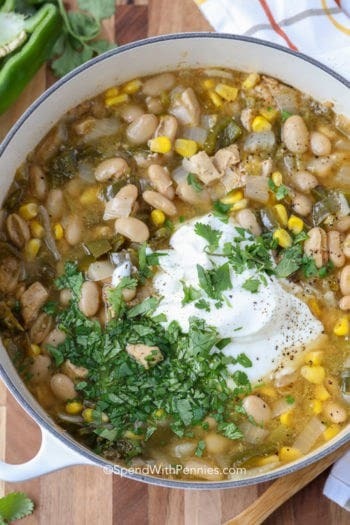 Chili beans add great flavor! What are chili beans? Usually either pinto or kidney beans with added flavors in a chili style sauce. Brown the beef, onions, garlic and some of the chili powder. Add remaining ingredients and simmer uncovered. Seriously, it’s that easy to make the best chili recipe! When making chili on the stove, I simmer it uncovered which allows the chili to naturally thicken without having to add cornstarch or flour. While thickening chili by simmering is the best option, you may not always have time to let it reduce. If you don’t have time to simmer it to thicken you can sprinkle in a little bit of cornmeal or make a cornstarch or flour slurry and add it in. If you can spare a few extra minutes, just let it simmer uncovered. 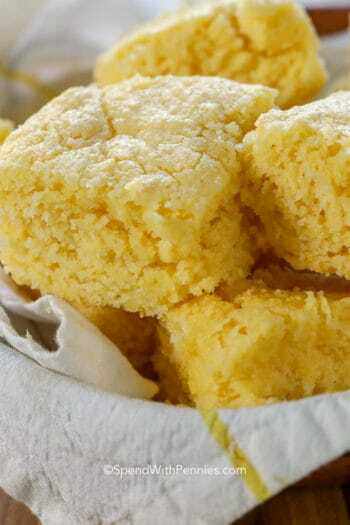 My #1 favorite of course is cornbread or just plain ol’ toast with butter. Pretty much any bread to sop up whatever is left in the bottom of my bowl! 30 Minute Dinner Rolls are great with chili too! 100% yes!!! Chili freezes and reheats beautifully. We freeze it in single sized portions for lunches or in freezer bags for a quick and easy weeknight meal. Defrost in the fridge overnight and heat in a saucepan (or the microwave) to serve. 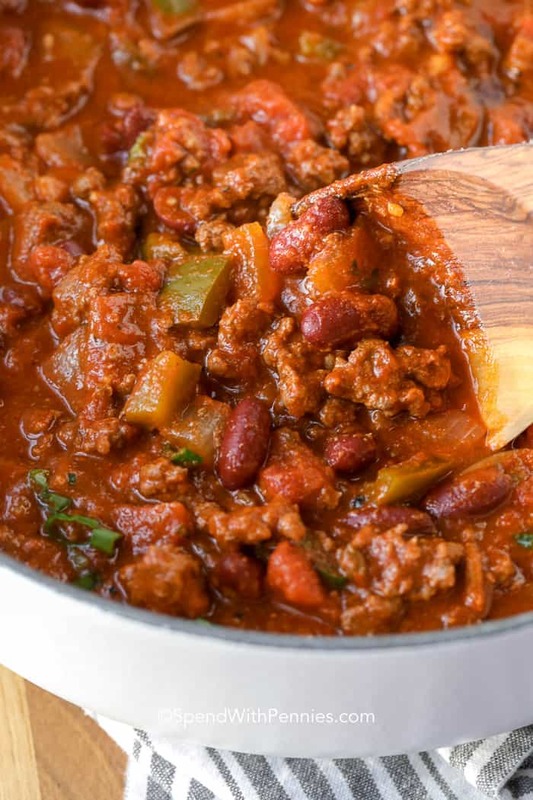 This is the best chili recipe! 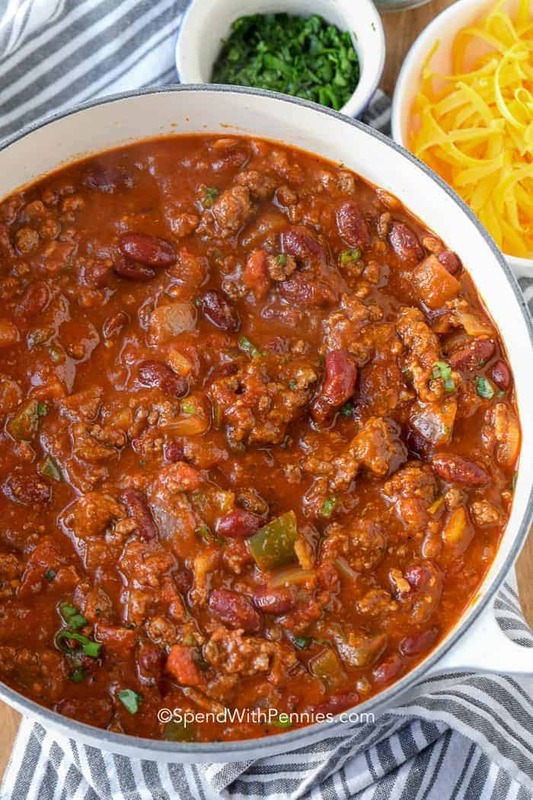 A big pot of ground beef chili loaded with beef and beans is the perfect game day food! Combine ground beef and 1 1/2 tablespoons chili powder. In a large pot, brown ground beef, onion, jalapeno, and garlic in a large pot. Drain any fat. Add in remaining ingredients and bring to a boil. Reduce heat and simmer uncovered 45-60 minutes or until chili has reached desired thickness. Top with cheddar cheese, green onions, cilantro or other favorite toppings. Yes, it’s lean beef loaded with tomatoes and beans (and veggies if you’d like). 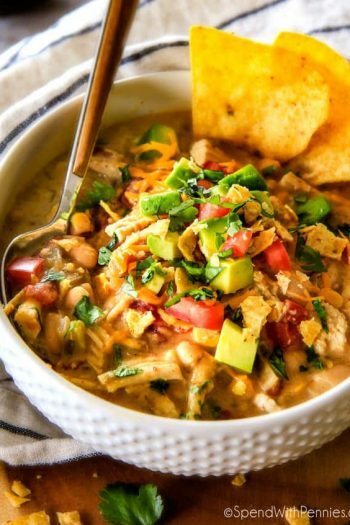 Tons of fiber, protein and flavor all in one bowl! 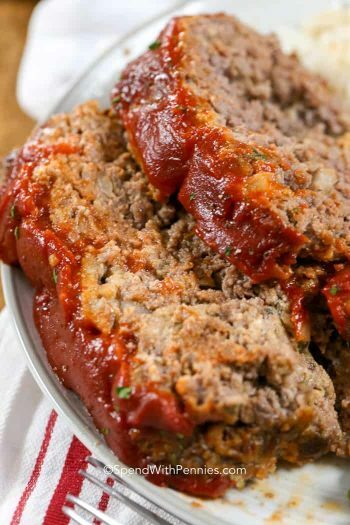 Be sure you’re using lean beef and drain any fat (or use ground chicken/turkey if you prefer). Choose low sodium or low sugar products to reduce the salt and sugar in this recipe.